The illustrious origins of the Tours crest can be traced back to the 14th century. The aldermen of the French city of Tours, which means "Turns", were given the right to be members of the court of kings, along with 35 other mayors of communes known as "good cities" in France. The history of Tours is intimately linked with that of Joan of Arc. Her testimony of the voices that guided her, whom now is considered a heroine, eventually led to her capture by the Burgundians, then sold to the English and her eventual burning for heresy. This Chenille tapestry is finely finished and highly detailed. 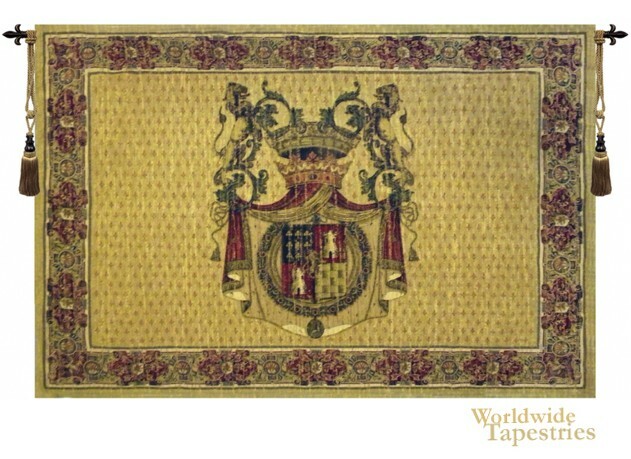 The chenille weaving is both soft and supple, perfect for hanging on a wall in your home to give a regal look and feel. Tours Crest - Horizontal is unlined and has a tunnel for easy hanging and display. Note: tapestry rod and tassels, where pictured, are purchased separately.